Well, it is now 2016, and as we prepare to start new projects this year, I thought it would be nice to review some ongoing projects from last year. As you read in Phil’s post back in September, we were able to install the new buildings for Hill Valley, including the depot, before the county fair opened on Labor Day weekend. This project included not only the new building arrangement, but revisions for track and roads as well. This year, we will continue with detailing the roadways, add additional scenery such as trees and shrubs, install interior detail and lighting in the buildings, and add signs to buildings and building windows. The new intermodal facility (left) has been roughed in with new plywood base and Homasote layer. The track has been installed, and necessary changes to turnouts for the new spurs completed. Next will be paving the entire area and installing the overhead crane. The paved surfaces will be painted and pavement markings added. 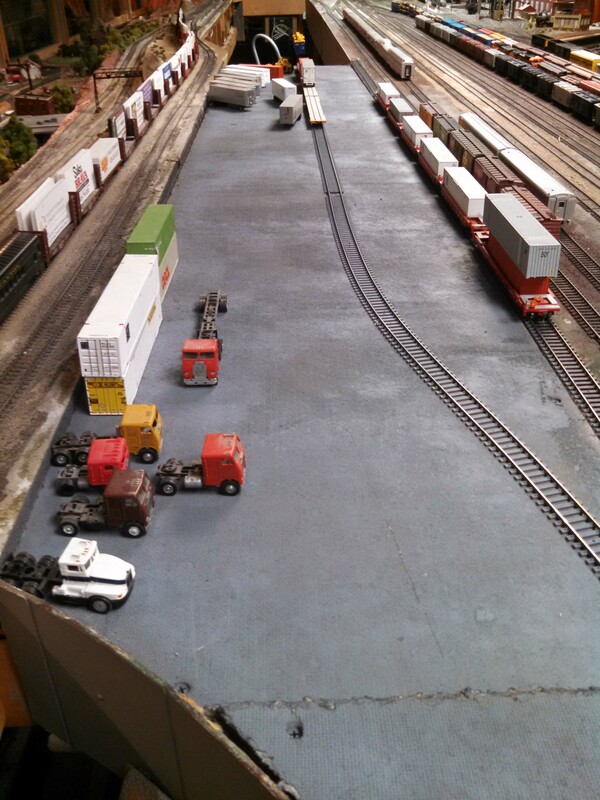 This facility has two tracks and will handle both trailers and containers. Supporting our goal of adding industries that are indicative of Northern Arizona commerce, we now have a woodchip loading facility at Glenview (below). The chip loader has capacity to load 4 cars on each of two tracks. Another ongoing project is the upgrading of rolling stock and repainting to establish a roster of Mountain Pacific freight and passenger equipment. 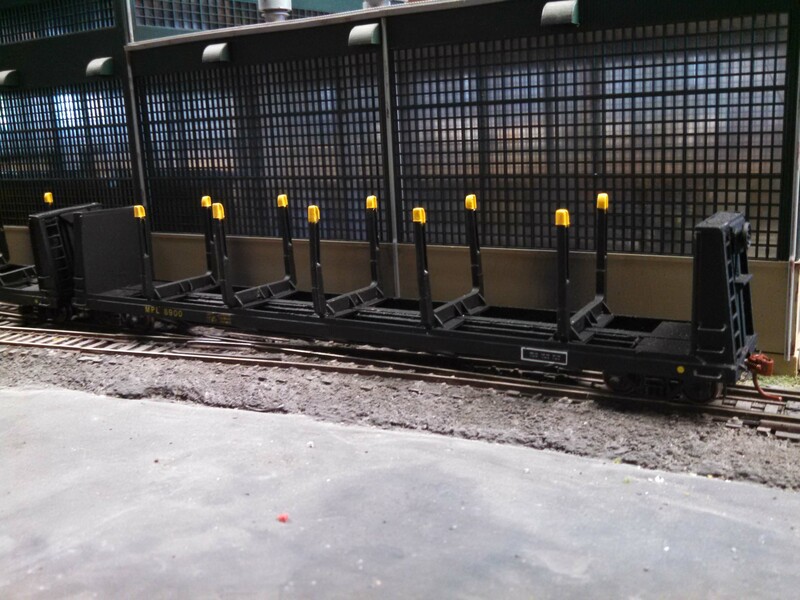 Below is one of two bulkhead flat cars for handling tree-length logs. These cars were originally Ambroid wood kits for a Northeastern U.S. protoype pulpwood car that had a center bulkhead and no stakes. These cars were donated to the club, and had various areas of damage to the floors and bulkheads. The floors were removed, white metal stake castings installed, bulkheads rebuilt, and grab iron and stirrup steps installed. Freights cars are not the only rolling stock being upgraded. 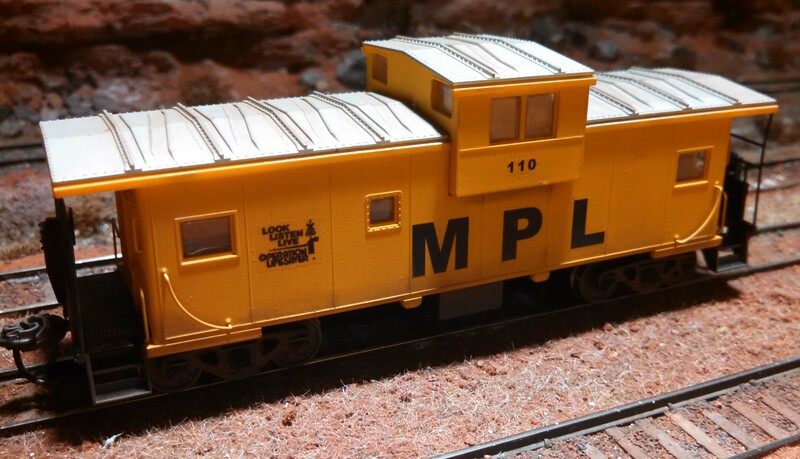 The club is working to build a fleet of locomotives and cabooses decorated in a revised paint scheme for the Mountain Pacific. These fleets will not be made up of random models, but will consist of groups of the same models to represent equipment bought in large lots from a single manufacturer such as is found on Class 1 railroads. 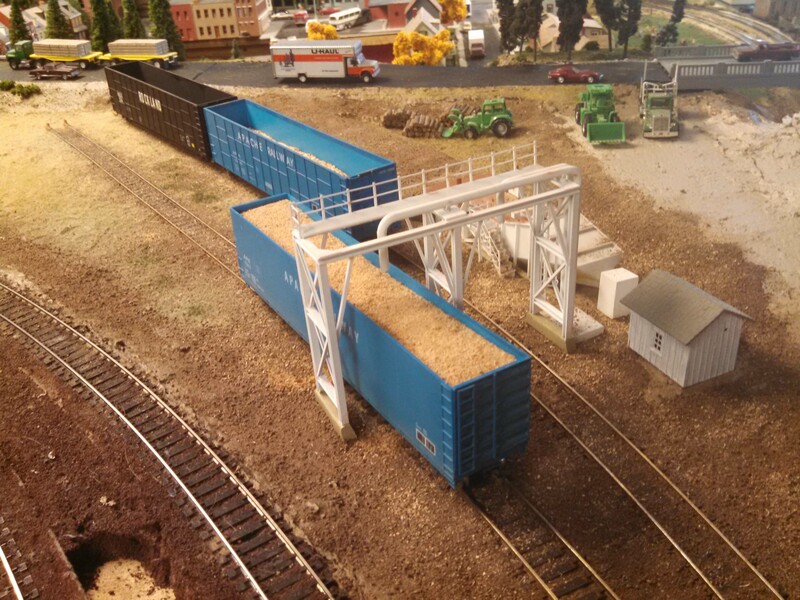 Below is an example of a CF7, and an International wide vision caboose. I will be adding more updates as the year progresses, as well as presenting status reports on our new projects. Happy New Year! This entry was posted in Projects-General. Bookmark the permalink.